We all realize Arizona is known for substantial and cumbersome commercial trucking traffic. This is especially apparent when sharing the road while you are driving in a smaller vehicle or operating a motorcycle. Phoenix and Scottsdale are the highest destinations for shipped goods. Unfortunately, this results in a high quantity of Arizona trucking collisions. Commercial operators of large trucks are required to attend rigorous education and training to qualify for a commercial driver license in order to operate a commercial truck, such as a “big rig,” typically used in the course of distribution and the transport of commercial goods. Typically, these vehicles are eighteen-wheeler tractor trailers, tanker trucks, delivery vehicles, and other large freight trucks. Even though the driver of a commercial vehicle may possess the highest level of training and skill, there are still inherent dangers, difficulties, and challenges in navigating these enormous commercial vehicles around smaller private vehicles. On top of that, commercial drivers of large trucks and 18 wheeler tractor trailers have to negotiate and drive these large vehicles which weigh as much as 80,000 lbs. This is more difficult when traffic is heavy, when the weather is bad and, especially, when sudden maneuvering is required to prevent an accident due to other road hazards and conditions. Normally large or commercial trucking accidents produce a wave of destruction and, more times than not, devastation. 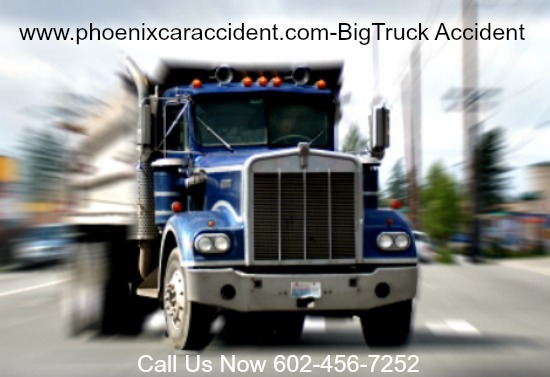 Besides the obvious damage following an 18 wheeler accident, accident victims who have suffered injury in an Arizona trucking accident face numerous amounts of legally perplexing questions. These questions may include deciding how to file a legal claim in order to be compensated financially for medical bills, for their injuries, their pain and suffering, and other forms of loss. Right from the beginning, following this type of accident or collision, the first and most difficult obstacle involves identifying the proper defendant. This is crucial to your case. If a truck driver, who was at fault for a collision or accident, causes injuries to others there are numerous possibilities in determining the defendant. You must be aware that the truck driver could be an employee for a trucking company and you would name both the driver and the trucking company as defendants. The Arizona truck driver may be an independent contractor or even a sole proprietor and this makes the case even more difficult to name the defendant. It can come down to the contractual business relationship between the driver and the owner of the commercial trucking company. In addition to naming the proper defendant or defendants to a trucking accident lawsuit, additional challenges can arise when it comes to the discovery phase of litigation. Discovery is basically the exchange of information that could serve as evidence for the parties when the matter goes to trial. There are several technicalities involved with the trucking industry, as it’s heavily regulated by the federal government. For instance, regulations exist with the federal government that involve the truck driver’s logs, the cargo that he or she is carrying, how that cargo was loaded, the weight of the cargo, who loaded the cargo, whether that cargo was properly registered as dangerous, if necessary, as well as many other questions that can arise. If someone who does not possess the proper level of experience is handling the discovery phase of an Arizona 18 wheeler accident lawsuit, it could lead to mistakes that include failing to ask for certain evidence. Semi-truck and tractor-trailer accident damages are typically severe since these vehicles are the biggest, as well as the heaviest, vehicles traveling over the streets and freeways. These accidents can be caused by tired drivers, below par maintenance of big rig equipment, or even poor road maintenance by the state of Arizona. Arizona and federal laws provide parameters by which semi-trucks and commercial vehicles must abide. If you or a loved one has been involved in a collision with a large commercial vehicle, we can help you understand those parameters. It is crucial to understand that being involved in a commercial truck or 18 wheeler accident is much more complicated and convoluted when compared to a normal car versus car accident. Handling a truck accident in Arizona by yourself could lead to a loss of your rights to lawful financial compensation for your medical bills, pain and suffering, loss of loved ones, and even private property damages. We advise you to seek a free no obligation consultation with our Phoenix Commercial big truck legal team. Our legal team of Lawyers and specially trained support staff will hold the drivers, as well as the trucking companies that own and are responsible for the trucks to be on the highways and byways of Arizona, accountable for the damages they may have caused.